We all want to live in a country that is fair and just. Scotland, in many respects, leads the way in our response to injustice and yet the prevalence of inequality and violence against women and girls goes against everything we stand for. Every 9 minutes Police Scotland receive a call about domestic abuse. By the time you’ve made a cuppa and sat down to read this another call will have been made. For every call made the reality is that many, many survivors don’t pick up the phone. Our vision at Scottish Women’s Aid is a Scotland with no domestic abuse, where women, young people, and children enjoy all their human rights and have equal opportunity to explore all their ambitions and aspirations. 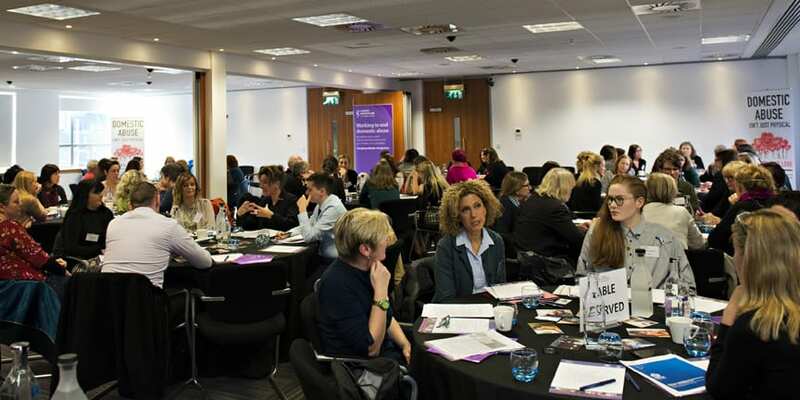 Delegates at the Scottish Women’s Aid annual conference discuss Scotland’s new domestic abuse law. 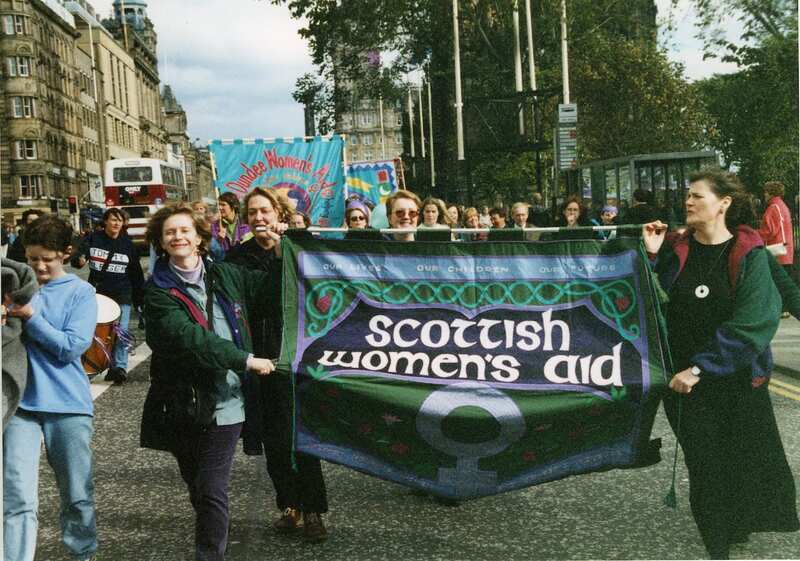 Women’s Aid in Scotland have a proud history that began in the 1970s where women in local communities organised and provided space and support for women and children fleeing violence, challenged inequality and lobbied for change. Now we are a network of 36 local groups working the length and breadth of Scotland providing specialist support to women, children and young people experiencing domestic abuse. This is much, much more than refuge space, Women’s Aid provide housing and social security support, advocacy, counselling and more. In 2015 Scottish Women’s Aid took over management of Scotland’s Domestic Abuse and Forced Marriage Helpline, a 24/7 service for anyone affected by domestic abuse. Fitting, given that for so many in Scotland Women’s Aid is a lifeline, a safe place to turn in a dark, isolating and frightening period of their lives. As well as support on the ground, Women’s Aid fight for improved responses to survivors of domestic abuse including from the justice system. We do so because if we aspire to live in a country that is just, then a lot needs to change. Although we have come a long way in how we think about, talk about and respond to domestic abuse in Scotland we should be in no doubt that there is a long way to go. This year Scotland will implement a pioneering piece of legislation that bridges the current gap between the law and women’s lived experiences of domestic abuse. This law brings many of the different forms of domestic abuse under one bracket, recognising that domestic abuse is not a one off incident and instead criminalising emotional abuse, psychological abuse, financial abuse, sexual abuse as part of a pattern of abusive behaviour and control. Of course, the devil is in the detail, and the significance of this law will be in its implementation. That is why we’ve been working with partners and professionals including the Crown Office, the Judiciary, local Women’s Aid services and more to prepare Scotland. To do justice to Scotland’s Domestic Abuse Act, there is no room for complacency. But laws alone won’t end domestic abuse. They can’t. And we can’t sit by whilst women and children continue to be taken hostage in their own homes, it goes against everything we stand for. Domestic abuse is overwhelmingly committed by men against women and is a symptom of much greater inequalities that hold us all back. As a nation that values justice we must do better. We want you to help us break the silence that surrounds domestic abuse. Speak up. Don’t make excuses or just let it slide. Engage with the uncomfortable, listen to and believe survivors, challenge power and inequalities and reflect on your own behaviour. They say that only thing necessary for the triumph of evil is for good people to stand back and do nothing. We believe that we can end domestic abuse in Scotland, but only with your help.